She Wood is a perfume by Dsquared² for women and was released in 2008. The scent is woody-fresh. It was last marketed by Angelini Beauty. Wonderful perfume, woddy and fresh with the pencil shaving vibe quite intense. I would categorize this almost like Paul Smith's Intense and Alexander McQueens My Queen. I could wear this all year round, especially during spring and summer. Longevity is decent and sillage medium. There is a hidden class in this perfume, though the price is quite high. Overall happy with my choise. After several attempts trying to enjoy this fragrance I finally gave up. I really wanted to like it because it contains woody notes which I love, but there is simply too much violet in it and I feel it is way too watery to my nose. The bottle itself is so nice and would have been a real ornament on the shelf. 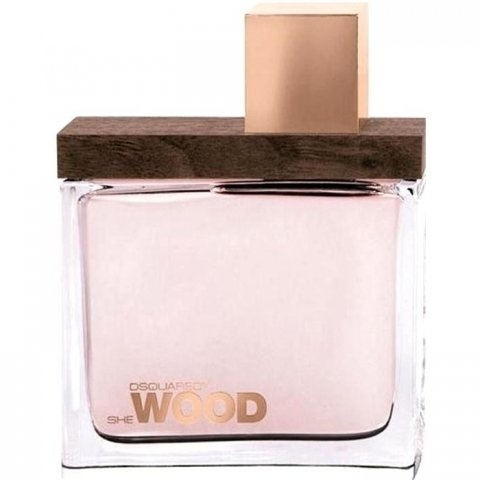 It has taken me a while to write a review of Dsquared SHE WOOD because I just cannot make up my mind about this perfume. I certainly love the violets, but there is something about the aquatic side of the composition which leaves me somewhat ambivalent. Maybe that makes sense, since I do not usually like aquatic fragrances. What is interesting about this one is that it does not manifest any of the seasickness-inducing qualities so common in the aquatic category. I have worn SHE WOOD several times, and never has it made me feel angst-ridden or sick. So why am I ambivalent? I feel that the quality is closer to the Salvatore Ferragamo INCANTO series than to more sophisticated violet perfumes such as Histoires de Parfums BLANC VIOLETTE or L'Artisan Parfumeur VIOLETTE VERTE. SHE WOOD is definitely distinct. I do not find it very similar to Trussardi JEANS (or its close cousin, Alexander McQueen MY QUEEN), nor is it very similar to the Sonoma Scent Studio violet perfumes. Despite its name, SHE WOOD seems very limpid and aqueous rather than opaque and woody, but there is a tinge of wood. Perhaps that is what makes this creation a bit odd. Rather than the usual treatment of wood, here we have a wood-flavored water. Of course, all perfumes are aqueous solutions, but this is a rare case where the water seems like an important note. This composition is not at all musky to my nose, and I think that floral woody aquatic would be the best category to place it in. Of course it would be nearly alone. The violet and aquatic aspects are similar to Balenciaga PARIS, but the wood makes SHE WOOD unique. Rather than agonizing further over my ambivalence, perhaps, in the end, I should just say that while I like SHE WOOD, I do not love it. I am sure that I'll use up my 100ml tester bottle, but I doubt that I'll buy it again. Doesn't work on my skin. Super sweet violet, coupled with jaw-jabbing white florals and masculine cedar shavings. Yes, a scrubber ... at least on me. I sold it to a fumie friend, and her dear hubby loves to wear it. He went through a 30ml bottle in a couple months. He says its its a unisex woody? Whaaaaat? 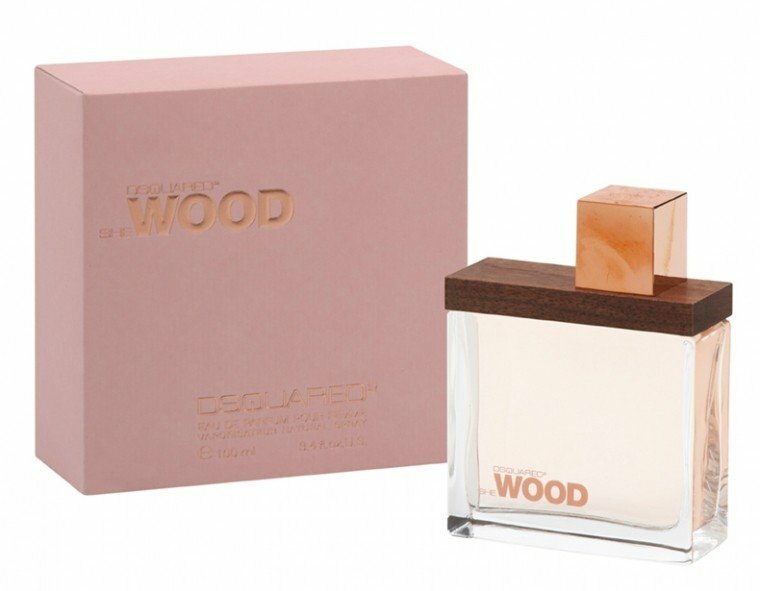 Sweet woody pour femme, plain & simple. If you want a unisex woody, try Mont Blanc Presence d'une Femme or Paul Smith Women. She Wood is a femme! Amazing how 2 people can see one fragrance so different, isn't it. She Wood opens with bright citrus but sweetens as it is worn. Although, I have to say the top reminds me alot of Eau de Shalimar. ;) On me, She Wood often gets too sweet & candy-like, but that sweet characteristic is so variable from wear to wear. I wish I knew why! I like it without all the candied florals in the middle. On me, the cedar does not dominate and the drydown is a subtle amber woody. I don't dislike She Wood. However, given the candy aspect in the middle, I think I'm about 25 years too old for it.